As the 2016-2017 cohort of Fulbright English Teaching Assistants (ETAs) begin their second semester of teaching, they are finding new ways to be active–sometimes physically!–in their communities. ETAs live across Indonesia, from North Sumatra to Central Java to Southeast Sulawesi and many places in between. What follows are a few highlights the ETAs submitted regarding their activities in January 2017. ETAs Shelby Lawson, Katerina (Kate) Barton, and Mackenzie Findlay made New Year’s resolutions to get more active, and they have been do so via adding yoga into their weekly schedules. 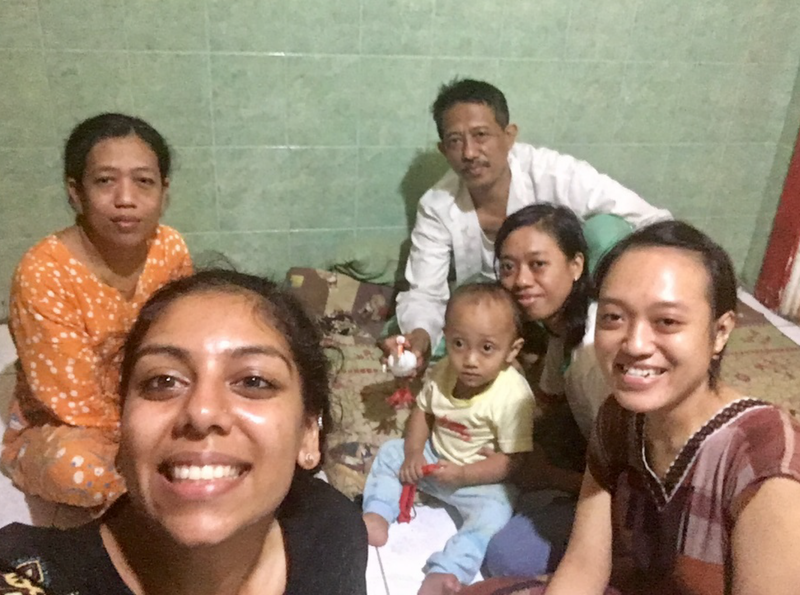 A large part of Kate’s grant has been spent practicing yoga with her landlord in their home, and she has enjoyed the yoga so much that she got her site mates, her counterpart, her Bahasa language tutor and other teachers from her school to join the class as well. 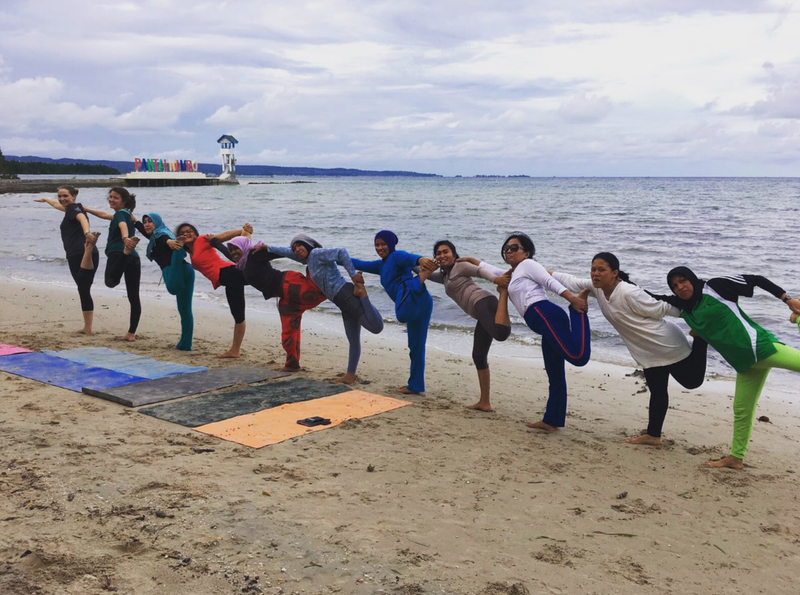 All of the ETAs in Kendari now join a local yoga class twice a week to exercise and socialize with fellow yoga-goers. Listening to the yoga instructions in Indonesian has definitely improved their Bahasa Indonesia language acquisition too! Recently, their class moved to a local beach, Pantai Nambo. Mackenzie and Shelby joined in the fun and had a wonderfully relaxing yoga session as they listened to the waves crashing while doing downward dog. After the session, some of the women wanted to try taking pictures of everyone doing fun yoga poses with the ocean in the background, and after lots of photos and laughter, they cleaned off their mats and shared a delicious picnic together on the beach. Kate wanted to pass this healthy and fun lifestyle along to some of her female students as well. At the beginning of the semester Kate noticed that some of her female students had talked about their weight and body figures in an assignment about New Year’s resolutions and decided to start a Women’s Workout Club at SMAN 4 to promote a positive body image. The club met for the first time on January 29 and the girls had fun working out, practicing English and learning about how strong women can be! Yoga been a great way to not only get active with exercise, but active in the community as well. The ETAs in Kendari hope to keep up their new habit throughout the year! 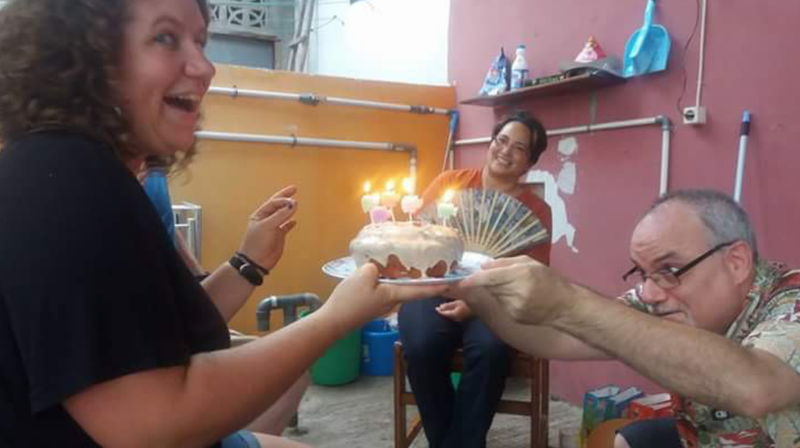 January was a really incredible month for ETA Julianne O’Connell who got to celebrate her 27th birthday all over Indonesia: both in Jakarta with her fellow ETAs and back at site with her community in Kupang. When Julianne first heard that the dates of the MYEC fell over her birthday she was bummed. She had been looking forward to celebrating her birthday with her students and her friends in Kupang. She was not looking forward to spending her birthday in a conference room in Jakarta. However, Julianne needn’t have worried, as her ETA cohort made her feel very loved and celebrated on her special day. After a day of seminars and lesson planning Julianne and her ETA friends went out for a delicious dinner of Indian food and ice cream which was a welcome departure from nasi goreng and es teler. Upon arrival back at site, days after Julianne’s actually birthday, her friends held a surprise party for her. Tired from traveling back from Jakarta Julianne hadn’t suspected it at and was touched by the thoughtfulness of her new friends. They ate pizza and roti babi and there were even party favors! The next night the kids from Julianne’s Neighborhood English club came over to surprise her with gifts and drawings and then they had a small dance party. Julianne never thought that she would be celebrating her 27th birthday with a gaggle of 2-12 year olds. The next night, a full 5 days after her actual birthday Julianne’s counterpart and her family treated Julianne and her site mate, Christal, to ayam baker at their favorite restaurant. There was cake and gifts and a lot of love. 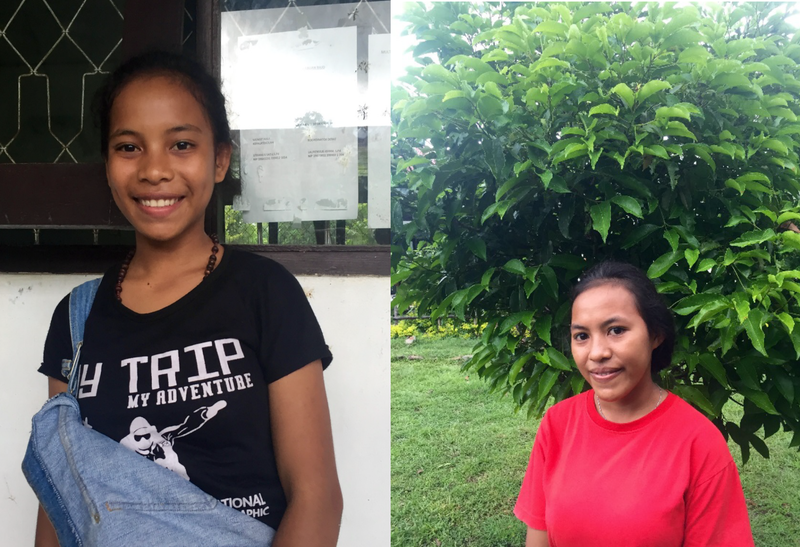 Julianne could not have imagined that she would be celebrating a birthday in Indonesia but she couldn’t have been happier to usher in a new year with two amazing communities and she is looking forward to the second half of her grant. 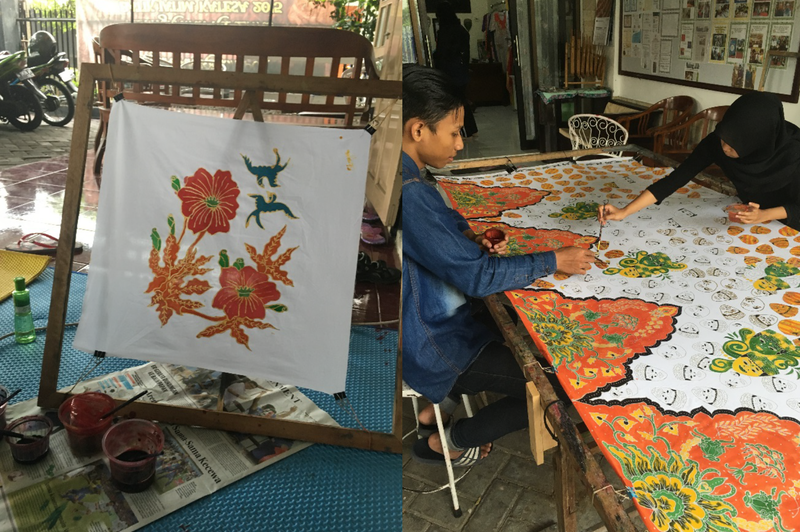 Over the course of the past few months, ETA Shreya Kundur has been learning the process of batik making and even creating her own custom batik piece. One of Shreya’s co-teachers, Bu Wiwik, along with her daughter Mbak Ima own “Batik Blimbing Malang” which is dedicated to preserving the art and culture of batik. Groups from all over Indonesia come to Batik Blimbing to learn about the history and process of batik making. Shreya has learned about the meaning of the patterns and colors that contribute to the unique beauty of batik. For example, blue can symbolize the sea or sky and can represent honesty, love and truth. Shreya has also tried her own hand at making batik through multiple series of steps involving melted wax and dyes. The process is slow and labor intensive, but the results are awe-inspiring. Shreya is so grateful to have the chance to learn such a unique craft and gain knowledge about the rich meaning and history of the clothes that people in Malang wear every day. ETA Kata Krueger had the pleasure of attending an outbound teaching training with the teachers and staff of SMAN 1 Bringin. This was such a fun way for Kata to get to know her teachers more and to bond with them. They are such a fun group of people to work with and spend most of the time they are not in the classroom making jokes and teasing in a light-hearted way, taking selfies, singing songs and laughing. Kata always feels so accepted and loved by all of them. The constant teasing reminds her of her uncles and she enjoys being close enough to her colleagues to banter back and forth and share many good laughs. The bus ride consisted of many teachers showing off their lovely voices by doing bus karaoke, the best way to pass a few hours on a bus. The afternoon included lots of silly games, such as passing a balloon around a circle of people using legs only and holding hands in a line while trying to climb through a sarong, hiking to some hot springs and waterfalls in the jungle and a talent show where Kata performed two songs despite her general dislike of signing in front of people. Everyone loved when she sang a children’s song in Bahasa Indonesia and she was joined by her co-teacher to sing L-O-V-E by Nat King Cole as a duet. 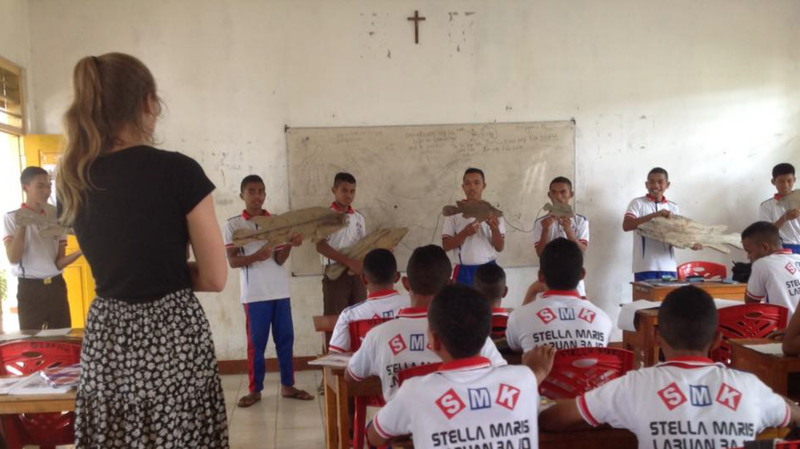 This semester, 10th and 11th grade NKPI (Nautical Program) students at SMK Stella Maris in Labuan Bajo are focusing on the marine ecosystems in Komodo National Park. 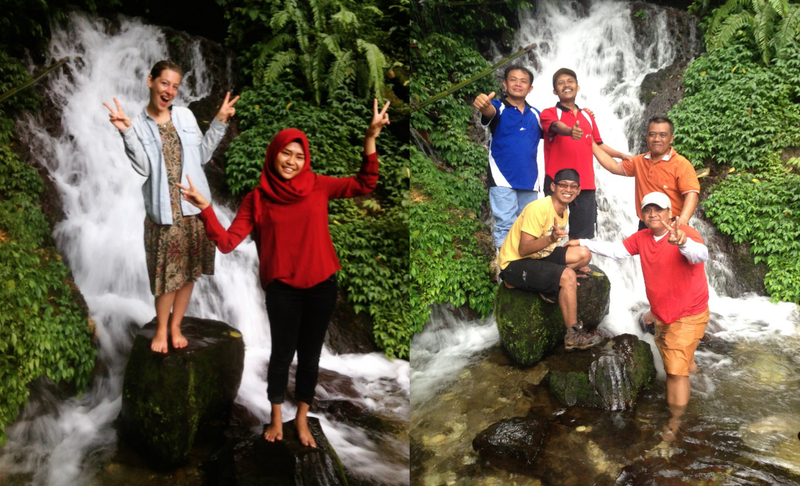 ETA Sam Geary is working together with fellow teachers, Pak Stefan (Maritime English teacher) and Pak Iren (NKPI Program teacher), to create engaging English lessons and English Club activities related to maritime ecosystems and sustainability using English. Here, students participate in an activity designed by Pak Stefan in which they are learning fish anatomy terms in English, and practice actively identifying and locating the body parts. As ETA Krupa Patel walked home on January 17th 2017, she contemplated ways to better engage with her community. As fate would have it, she stumbled into her neighbor’s house shortly after and found a scene that she would find at her home in New Jersey. She found Nisa, Wendi and their parents sitting cross-legged on the floor folding brochures. Pak Yasir is a printer who runs his business from home just like Krupa’s father does in the U.S. Krupa remembers sitting on the floor of her own living room after dinner with her brother, parents and grandmother folding brochures. Joining this family brought back memories and reminded Krupa that these are the connections she wanted to build. This big family of two parents, three daughters, a husband and a grandchild were just like her family–a big family filled with lots of love, kindness and food (and of course, less chaos than her actual family!) Ibu Suyatmi constantly makes sure Krupa has vegetarian food and nasi to eat. Pak Yasir teaches her Bahasa Jawa and history through conversation. The daughters, Nisa, Wendi and Eva, hang out, paint their nails with Krupa and teach her Bahasa Indonesia. They also frequently rescue her from vicious cockroaches and even helped bail water out of her house after a thigh-deep flood on the street during a mati lampu! Krupa feels extremely blessed to know such a sweet Indonesian family who are more than just neighbors—they are family. 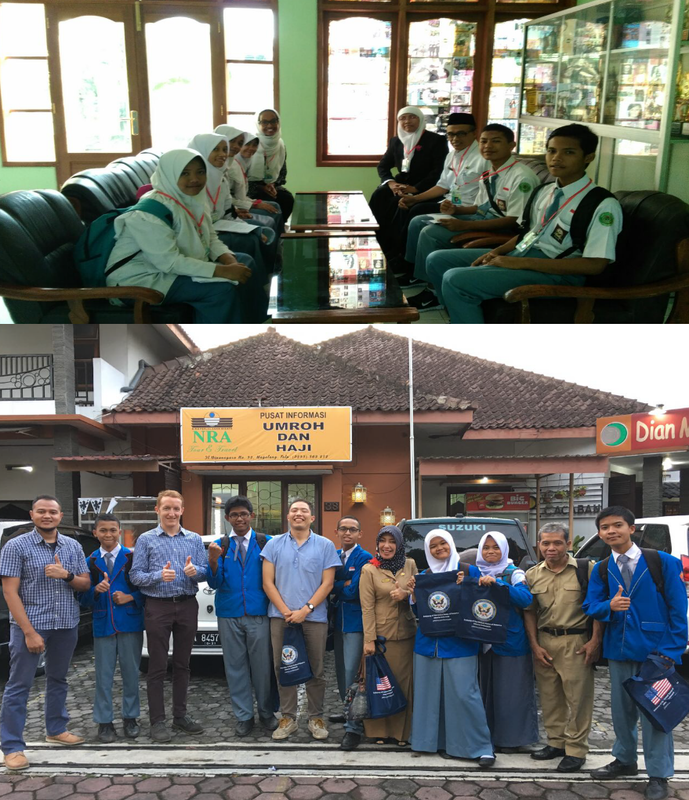 SMKN 1 and MAN 1 Magelang were fortunate enough to be selected as schools to participate in the Indonesia Youth Leadership Program On Demand 2017 (IYLP), run by the United States Embassy. Held in Bloomington, Indiana, IYLP is a fully funded month-long summer leadership and community service workshop for Indonesian high school students. ETAs Julius Tsai and Siham Abdi worked with students of SMKN 1 and MAN 1 through the application process which included a preliminary interview, a packet of essay questions, and multiple editing workshops. Of the sixty-plus students who applied, twelve made it to the final round of interviews which were held with staff from the U.S. Embassy. Despite their nervousness, students rose to the occasion to showcase their immense talents and bold ambitions, making their teachers and ETAs very proud. 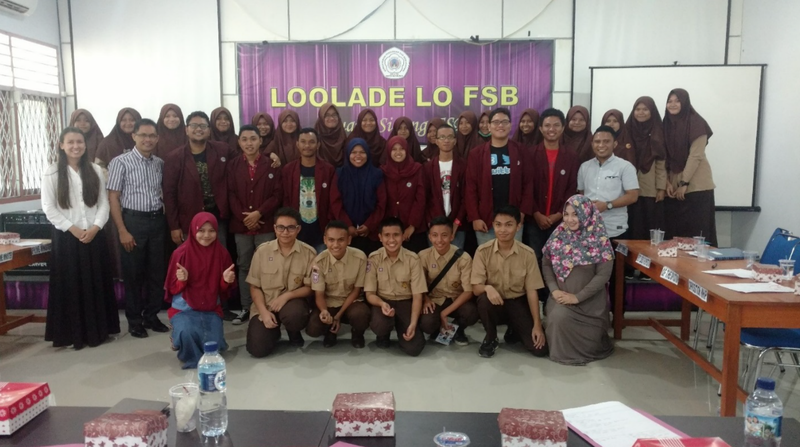 ETA JoAnn Doll and co-teacher Pak Mustain accompanied twenty-two MAN Model Gorontalo students to observe the final round of a university debate competition held by the English Department at Universitas Negeri Gorontalo on January 20, 2017. The interested 10th grade students watched their first British parliament-style English debate in preparation for participating in MAN Model’s first English Debate Club. After the debate, the students practiced their English by asking the university students questions about how to build confidence in speaking and debating in English, as well as inquiring further about their personal opinions on the topic of the debate, “tiger parenting.” On January 27th, the first Debate Club meeting led by Pak Mustain and Miss JoAnn was held at MAN Model, where students practiced arguing for and against the use of cell phones in schools. Afterwards, some of the students stayed afterward to enjoy pizza. One week in January, a friend’s innocent text of “what’s up?” turned into an opportunity for ETAs Kelly Fitzgerald and Krupa Patel to have a cooking party at Kelly’s house. Over the school holiday Krupa received supplies such as taco seasoning and pepper jack cheese, so the ETAs decided to make Mexican food for their Indonesian friends. On the morning of the party, Krupa and Kelly shopped for fresh vegetables at the traditional market near Kelly’s house. Once their friends from Universitas Airlangga arrived, the food prep began. The menu included deviled eggs and burritos filled with Mexican rice, fried beans, pepper jack cheese, homemade salsa, and guacamole. The guacamole in particular caused a lot of curiosity because avocados in Indonesia are generally used to make sweet drinks. 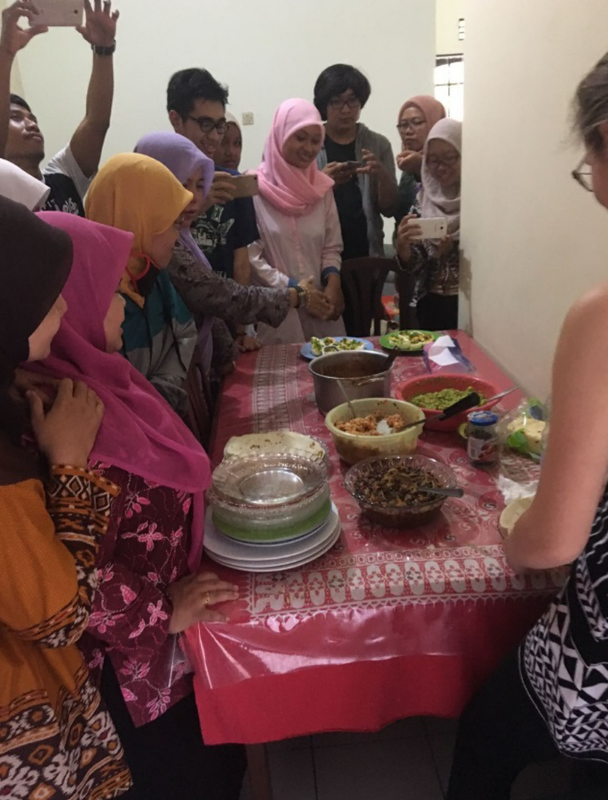 During the party, a teacher from SMA Khadijah (Krupa’s school) and a handful of teachers from SMA Wachid Hasyim 2 (Kelly’s school) stopped by to taste the food. Everyone seemed to like trying the new cuisine. By the end of the party, there were no leftovers! Dolok Tolong. The behemoth looms over Balige. It dominates the landscape. Through the sunshine and the storms it stands alone with quiet power. On clear days, the pine trees are a bold green against the blue sky. Rainy mornings, ghostly white clouds cradle the mountain, and in the magic hour of sunset, it’s lit in a golden evening glow that never fails to instill a sense of peace and contentedness in ETA Daniel Gerardi. It has come to represent home. On January 22nd, Daniel joined the entire class of the 11th grade dormitory students on their adventure up the mountain’s long and winding trail. It was his second time climbing the mountain, having gone once before with a few 10th grade students. They piled into two buses and rolled off to the trailhead. 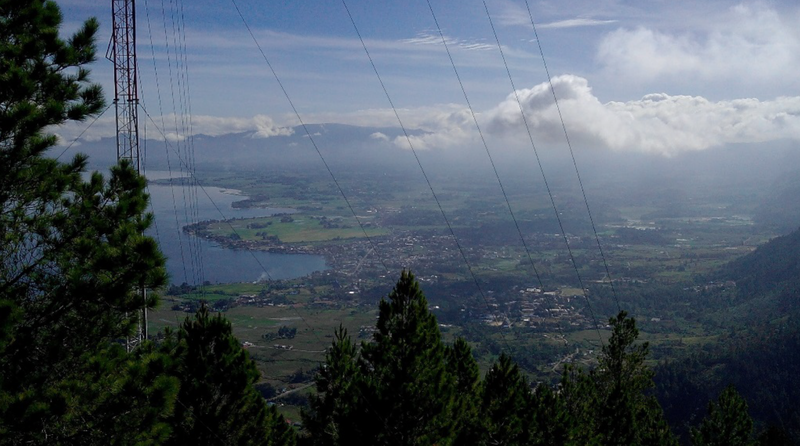 The hike up to the top takes a little under two hours, which is not so long for an avid hiker, but it had been awhile since Daniel had gone hiking, so he and his friend Simson had taken to repeating the mantra “just five more minutes” whenever they felt too tired. On top of Dolok Tolong, the 11th graders were set free to socialize, after a short prayer service led by the students (it was Sunday, after all). It was wonderful to see them away from the dormitory, away from the rules and strict structure, acting like—well—high schoolers. They gathered in small groups and played guitar and sang, sat awkwardly next to their crushes, ran around, goofed off, and took endless photos (with the supervisors’ phones, of course, as they aren’t allowed their own phones in the dorm.) They had a few hours on the peak to be free and frolic and take a break from the high-strung life of the dorm. The top of a mountain is a fitting place to find that freedom. There’s always a sad feeling to head back down, back to the real world, back to rules and responsibilities where things aren’t as simple as putting one foot in front of the other, surrounded by pines and flowers and laughing voices. Dolok Tolong is one of the places Daniel will miss most. He’s grateful he’s had the opportunity to climb it with so many friendly people, and he plans to hit the trail at least a couple more times. 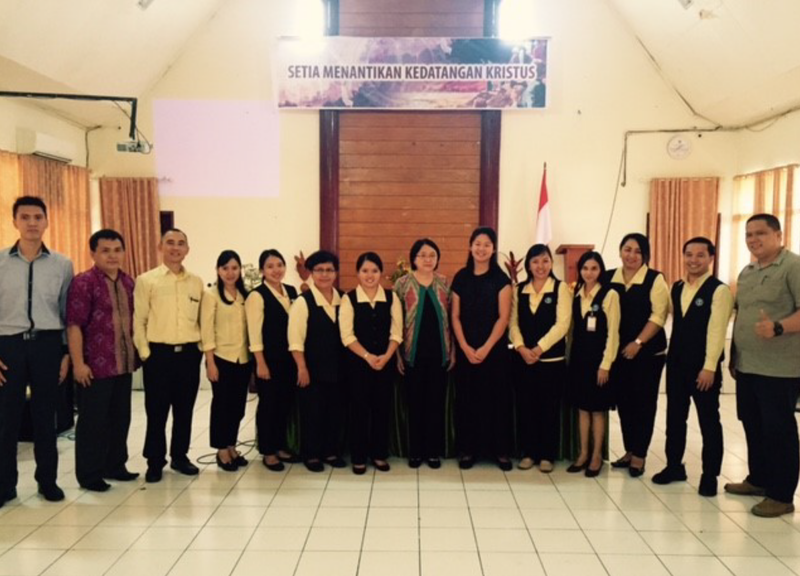 On Monday, January 23rd, ETA Mei Lin Pratt and the English teachers from Eben Haezar were joined by the English teachers from two other private schools in Manado to participate in an afternoon English training workshop. They were lucky enough to be led by Ms. Sisilia Halaimi, the Vice President of TEFL (Teaching English for Foreign Language) and a lecturer at the University of Indonesia. During the afternoon they learned valuable skills to use with their students in the classroom. They focused on the definition of active learning and how incorporate more activities into their lessons and to make sure their students understand the material. Not only was the workshop beneficial to the students and the teachers, but it helped bring together three different schools in an effort to foster an ongoing relationship between them. Eben Haezar hopes the next workshop will be just as entertaining and successful and will bring even more schools together to communally raise the level of education in high schools throughout Manado. The students of the 10th grade English Club at SMK Negeri 1 Labuan Bajo began an exciting new project on January 23, 2016. “Unity in Diversity” is a Community Engagement Project being conducted by some of this year’s ETA cohort. The project aims to highlight differences and similarities across Indonesia, unify communities, and help students practice English. “Unity in Diversity” is based off of the famous photojournalism project, “Humans of New York.” Students are responsible for interviewing classmates and communities members using English. During the January meeting, the English Club members of SMK Megri 1 Labuan Bajo, with the help of ETA Anna-Sophia Katomski, interviewed each other using questions such as: “Why is education so important?,” “Why should other parts of the world learn about Indonesian culture?,” and “What makes you happy?” Their answers were recorded and their photos were taken, later to be published on the project’s Facebook page titled, “Unity in Diversity: Collected Stories” and on the project’s Instagram @unityindiversitystories. Students really enjoyed learning more about their classmates while also practicing their English. Interviews will continue with community members later on in the semester. Stay tuned! The week of January 23, ETA Ayat Abourashed did some spring cleaning and found sheet protectors in one of her binders. She decided to make these sheet protectors into “whiteboards” and create a lesson plan using her new tool. The students were learning about present perfect tense. Ayat put the students in pairs and each pair received a “whiteboard” and a marker. Ayat wrote a sentence on the board with a blank where the verbs would go. The students had to come up with verbs in the present perfect tense and write them on their boards. The whole lesson was a success. 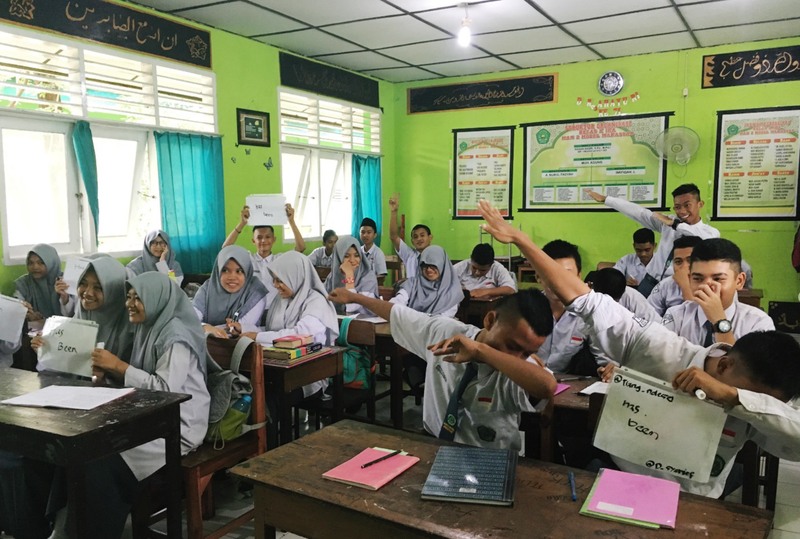 The students in Grade 10 IKA loved the homemade boards so much they started dabbing in class! 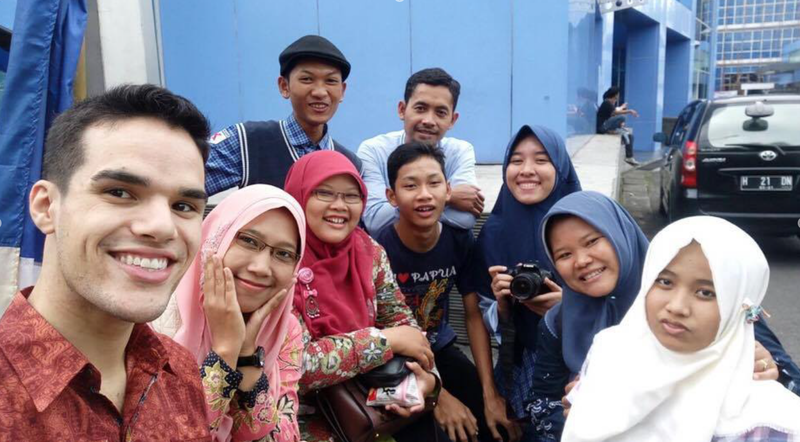 On January 24th, ETA Vinny Owen accompanied a small group of his students and teachers from MAN 2 Kudus to an English speaking competition held at Dian Nuswantaro University in Semarang. The students were participating in a number of different categories, including: theater and drama, essay presentations, speech recitations, and storytelling. Prior to the competition, Vinny helped the students prepare their performances during the preceding weeks. He enjoyed being able to watch the students’ final performances after weeks of hard work. And the hard work paid off, as one of the students won first place in the essay presentation! “Everyday heroes” was the theme for this category, and the student gave an excellent performance, talking about how his parents are the everyday heroes and role models in his life. ETA Lizzy Hardison made a New Year’s Resolution to be more physically active at her site. At the end of the month, she made good on that goal by joining a new muay thai gym. Muay thai is a combat sport from Thailand that has become popular throughout Southeast Asia. After a quick search on Google, Lizzy found Tiger Muay Thai in Pangkal Pinang and immediately tried her first class. After two and a half hours of doing pushups and sit ups, jump roping, and sparring, Lizzy bought a membership for one month of classes. The best part of her new gym isn’t the sweat or calorie burning, but the welcoming community that it offers. Within a week of her first class, Lizzy joined other gym-goers for a Chinese New Year party and after-class soy milk dates. She is excited to improve her muay thai technique and build new relationships for her remaining three months in Indonesia. January was an exciting month at SMA 2 Malang! At the end of the month ETA Caroline Rose joined her school in welcoming students and administrators from their partner school in Thailand. 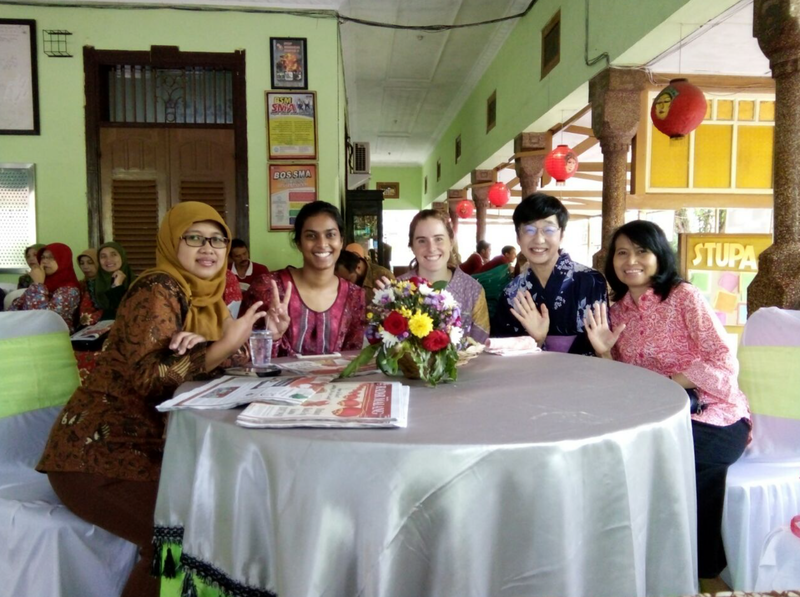 For the welcoming ceremony, Caroline dressed up in traditional “kebaya” alongside her teachers. The ceremony served as a special occasion for Caroline to see the teachers show off their Javanese formal wear. In particular, Caroline enjoyed seeing the Indonesian and Thai students meet and greet one another, and of course, take lots of selfies. Several days later, for the send-off celebration, Caroline’s sitemate, ETA Shreya Kundur also got to participate. It was a fun day for all as SMA 2 students and teachers sang, danced, and cheered to give their Thai guests a festive parting memory of their time in Indonesia. Bringing together educators and students from America, Japan, Indonesia, and Thailand, it was a great celebration of cultural exchange! On January 28th 2017, a small group of SMA Negeri 1 Salatiga staff took an afternoon trip to Gua Maria Kerep, a pilgrimage site located in the small town of Ambarawa. Gua Maria Kerep is a pilgrimage site that contains exhibits on the life of Jesus Christ and even has a model of the garden tomb where Christ was supposedly buried. 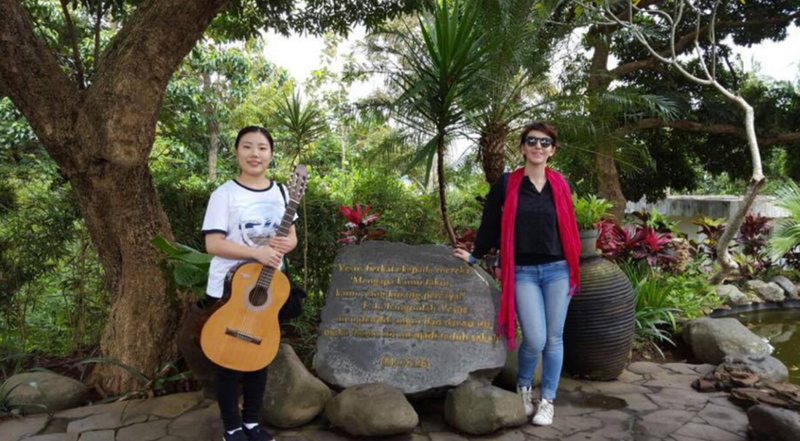 ETA Michaela Chinn and Japanese Teaching Assistant Narumi Hidaka enjoyed walking around the pilgrimage site while Ibu Nurhajani Handojo was their tour guide. Also, Bapak Bambang Israel, Michaela, and Narumi enjoyed an informal musical session singing the Beatles.